You can only use the (2) effect of "Arcanite Dragon" once per turn. 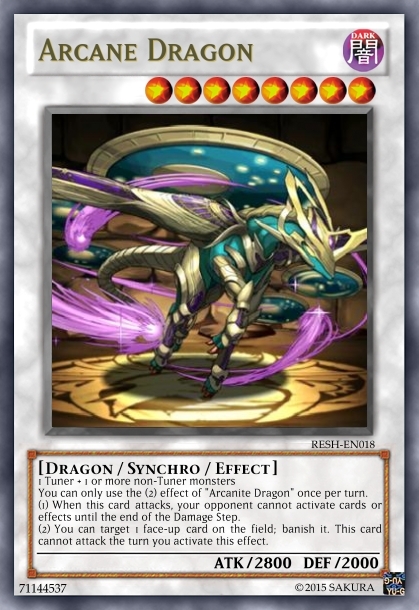 (1) When this card attacks, your opponent cannot activate cards or effects until the end of the Damage Step. (2) You can target 1 face-up card on the field; banish it. This card cannot attack the turn you activate this effect. 25K post stuff (and yeah, lack of suitable images burns at times when it's for stuff like this). Anyway, first effect is pretty much Armades, so you don't have to put up with backrow (or hand traps) while it's striking. Second effect is themed after Sorcerer to an extent, but can target any card on the field (including face-downs & backrow/Pendulums. Was considering making this as a 7, but then the Level 7 Synchro pool is rather full right now (see Yazi, Black Rose Moonlight, etc), so it's an 8 instead. Stat-wise, it should be sufficient enough for a Level 8 with 28/20 stats, especially given its ability to lock down effects during attacks and banishing. Edited by Sakura Haruno, 06 August 2015 - 07:38 PM. Reduce the banish to face-up monsters only, and then you'll be golden. Maybe drop the def a bit so that it's not too impossible to get over in the cases of Whip Snake/Mirror Conductor/BoM/etc. As is, it's too versatile, which means it does too much. There's more design synergy if it only hits face-up monsters, as that means it can answer any monster, but leave FD ones to swinging and face-up to either. Card banishing is just too open ended and strong. The flavor is weird, though, as this has nothing to do with Arcanite Magician and her evolutions/supports. 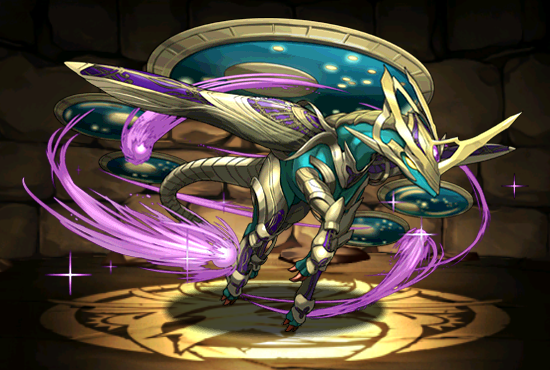 Arcane Dragon seems like a better name. I can reduce the DEF to 1800-2000, and certainly the banish can be changed to face-up only. (Yeah, it hits too much; especially given 8s do have more support cards). As for the naming, it's not intended to be related to Arcanite Magician and evolutions, but I can change that, so it's not linked to it. Might be a carryover from where I originally found the pic, but idk. If I have time, I might put this on DP.